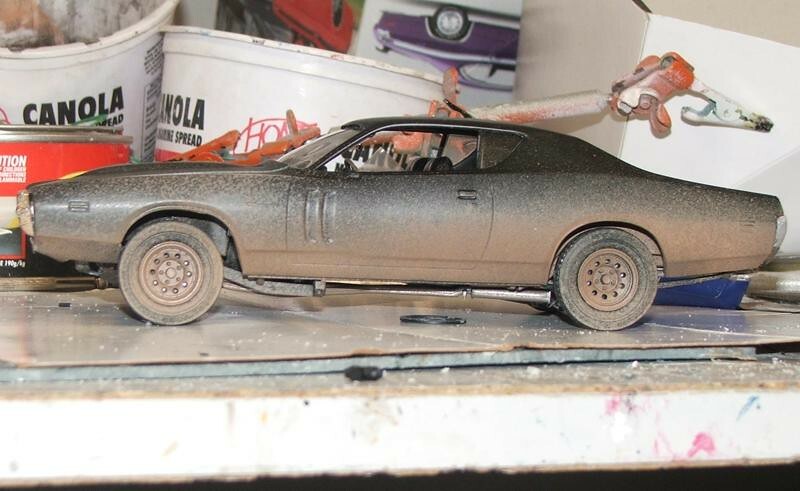 I am building the AMT 71 Charger (changing it to a Super Bee). IRL it was my second new car. The chassis is seriously warped and I am slowly bringing it to square using hot water and gentle pressure. I was reading Tim Boyd's new model book and read where there is an issue with the wheelbase and position of the tires in the wheel openings. Does anyone have more information and more importantly a fix for the issue? Thanks in advance. The wheels on the front suspension are placed too far forward and need to be positioned a little farther back. Elongate the holes in the frame crossmember to move the K-member back slightly with the spindles in place. The spindles will be leaning a bit so be sure you glue them securely. Ride height will not be affected too much. Do not remove the upper A-arms from the frame unless you plan on pinning them to the frame which is more work to do. Tachy...first, thanks for purchasing my new book.....hope you enjoy it! If you go to the back issue department here at Scaleautomag.com, and search the issues around 2001-2002, you'll see an issue with a big green 1971 Charger R/T on the cover. That's the issue that has a detailed article/kit review/buildup on the AMT/Ertl kit and shows how I corrected the wheelbase issue. Tim, your book is great and brings back a lot of memories. Yes, I had a Plum Crazy 71 Charger Super Bee. That is what I am going to try to model. I have a correct hood and tail panel and the 383 engine out of the 69 Dart kit. I have the SAE in question as I have a complete set (except for the ones I sent to Robby for their DVD project). Aussie, thanks for the picture. I was wondering how bad it would be if I did not fix it and your picture convinces me that it has to be fixed. How a company can miss on such an important point as wheel base is beyond comprehension.